"A Great Welcoming Home from Our Friends"
"Signing on the Dotted Line"
They say all good things must come to an end, but what they don't say is that after that, it gets even better. Today will the be the last time we post to Green, Party of Four because tomorrow, we will become Green, Party of Five! If you have enjoyed reading this web log, we would like to hear from you. So, without further adue, here are some thoughts on what this web journal has meant to us for the past couple of years. "Our First Picture of Lily Grace"
She was just a baby, born hours earlier that day, when they placed her at the entrance to the orphanage. Something had happened to her foot and perhaps her parents could not afford to take her to the doctor. Or perhaps, they simply could not keep her because life's circumstances dictated that their only child be a boy. And she was simply too much of a burden. So they placed her at the gate, in hopes that she would be found soon and taken inside to be raised and cared for by angels who did God's work in caring for children left all alone in this cold world. "Green, Party of Three Tours the Great Wall"
Lily Grace was abandoned on the day of her birth, September 24th, 2004. We are sure that her mother did so only after all other options for her were exhausted and we believe that because she loved her newborn child, she did what she thought was best for her. Our heart breaks that she had to do this. Others have said that her loss was our gain. We believe that's a simple-minded understanding of this complex social issue and we choose to believe that God simply had us in the right place physically, emotionally, spiritually, and financially to bridge the gap for this precious little life. And we will do everything we can do to make sure Lily Grace experiences life to its fullest extent and that she learns about her Savior. "First Picture of Green, Party of Four"
Others have said that they admired us for doing this, in effect implying that our actions saved Lily Grace. While that may be true in part, we choose to see all the blessings that God has bestowed upon us through her life. One of the greatest things we've been witness to in this is how our son Austin, an only child for 12 years, has given of himself so freely and become a wonderful big brother. And what God has accomplished in both Connie and me has been truly a miracle. Through adoption, a beautiful witness to His plan for us, He has truly changed our lives and given us the ability to see Him in the everyday small things that happen around us and that others call circumstance. And for that we are ever grateful and thankful. "Austin and Lily Grace on the Second Day"
"The Famous Red Dress Photo"
We have every hope and belief that Lily Grace, or one of the other children saddled with her early life circumstances, will one day return to China with solutions to problems that have haunted the beautiful Chinese nation for years. It all started a little over two years ago after Connie, Austin, and I committed ourselves to adopt a little girl from China, who would become our sweet baby girl, Lily Grace. 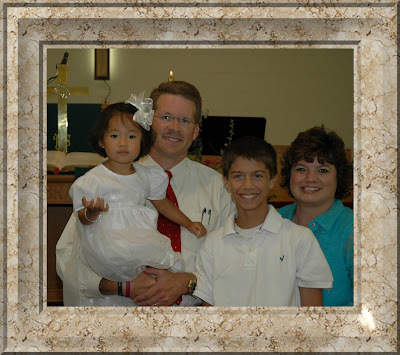 At that time, we had met some really great and cool friends, Drew and Lori, who had already adopted three little girls from China. Lori was so excited that we were going to adopt, she called and emailed every day asking how things were going. Then she began gently convincing me (Jerry, where is that journal entry!!!) to put our information into a web log so she and others could read it at their leisure and at times that were convenient. "A Tear Jerker Photograph if Ever There Was One"
"A Tear Jerker Photograph - Part Two"
"My First Trip to the Lotion"
As the days until we left for China that first time dwindled, Lori decided to step up her efforts and eventually got me to comply and initiate our web journal and give it the name greenpartyoffour.blogspot.com. Actually, the name was Connie's idea and it seemed to fit wonderfully. After initiating the web log, we learned very quickly how important it was to us, especially while we were in China, to hear from our friends and family and to know that they were praying for us and thinking about us. If you've ever been away from the US in a place where you are the only Americans in a city of 4 or 5 million people, you know what I'm talking about. We've found the Chinese people to be extremely kind and pleasant to us, but it's just important to know that your friends and family are thinking about you. "I Love My Sweet Baby Girl"
"My Sweet Baby Girl Loves Me"
Up until the time we started the journal, we felt somewhat isolated in what we were doing, because there simply weren't many people who were adopting children from China. The web journal gave us an opportunity to share our thoughts and to document things for Lily Grace. After that, we became friends with so many other families who were experiencing the same events, thoughts, questions, and emotions that we were and it was a comfort to know that we weren't alone in this endeavor. The responses from our family and friends have been a great blessing in our lives. "Inviting You to Follow Us Again as Green, Party of Five"
We have used the journal to document our adoption of Lily Grace, as well as to describe life in the Green household in the days since her adoption. Austin has even got in on the act by starting his own journal when we were in China to adopt Lily Grace. We've shared birthdays and ballgames, Bible verses and baptisms, bandaids and band concerts, CC concerts and Christmases, doctors visits and dancing, and all manner of other things that make life what it is in the Green household. We hope that you have enjoyed reading it as much as we have enjoyed your encouraging comments and we hope that you will contine to follow along our journey as Green, Party of Five at greenpartyof5ive.blogspot.com. Tomorrow, our Gotcha Day, we will remove access restrictions to that web journal to make it easier for you to follow along on our Journey to Lia Faith. Green, Party of Five - Officially as of Tomorrow! Her name is Wanda and she teaches us how to speak Chinese. Now, if that doesn't crack you up, you need to check your funny bone. A couple of boys from 'bama learning how to shoot the breeze with the Chinese. We've had several lessons now and Austin has seemingly taken a commanding lead in the intonation and pronunciation of the Chinese characters. Ms Wanda says goooood, verrry gooood each time he volunteers to read the next page. Then she looks at me with a look of impending disappointment, as if she knows already how badly I'm going to butcher "Good Morning!" She asked me for a picture. I think she's going to use it as a poster child for Chinese challenged southern boys. Of course, I've already learned more than my southern girl and her mom and my mom learned a couple of years ago from the same Ms Wanda. Seems they couldn't do anything but laugh - as I write this, I'm having deja vu about their learning disorder - at the various nuances of the Chinese language. I don't know what happened in those classes, but I do know that none of the three amigoettes ever uttered a word of Chinese in Beijing, except for the occasional "Knee How" that elicited strange looks and sent locals slowly moving away, confused looks populating their countenance! Poor Wanda, had to deal with the ladies a couple of years ago and now this. Oh well, at least Austin gets it. He'll probably have to be my interpreter to the interpreter when we go back to China to bring home Lia Faith. So far, we have learned many vowels and many other characters that aren't vowels and we've learned the four tones. We've learned that the Chinese language is a monosyllabic language - each word consists of only one syllable. The only thing close to our multi-syllable expressions is the fourth tone which calls for the pitch to start high, decrease to a certain point, and then increase again. I can't help but make my head go down then back up as I try desperately to get it right. I must look like Jar Jar Binks in my efforts. But, we've turned what we've got so far into over 100 words and can even put a few together to utter something that sounds Chinese. There's a good side and a bad side to getting the tones correct. The good side is that you're not likely to call your mother a horse. The bad is that if the Chinese see that you get the tones correct, they will assume you know Chinese and it'll be off to the races!!! At least this time, maybe I won't order vegetarian cheeseburgers at the Beijing McDonalds - you know, hamburgers without the hamburger. The clerks and cooks were all giggling and looking at me when I did that in Nanchang and finally Sally (our local interpreter) cleared the matter up by curiously asking me if my family were vegetarians. The she too joined in the laugh fest and I felt like Gomer Pyle at a logistics convention! Anyway, we've been very busy lately trying to get Lily and Lia's bedroom and playroom finished before we leave - cause we know for sure when we get back, time for projects is probably nil. We turned the playroom into a bedroom and the bedroom into a playroom. Painted the walls of the newly annointed bedroom a shade of lime green that glows like Reactor Number 3 at Brownsferry. Seriously, from downstairs, you can see up the stairs, around the corner, and out the window, the refraction is so signficant from the color choice. If that weren't enough, we painted the ceiling in the new bedroom first pink, then yellow. Where's my Pepto Bismal? Poor Austin. His room upstairs is the last remnant of manly paint schemes in the entire upstairs. A pink room, a purple room, and now a lime green room. Pink ceilings, purple ceilings and yellow ceilings. Not to be outdone by the walls, the new ceiling fan sports 5 blades, each a different color! As far as our adoption of Lia, we are on our way!!! TA came and travel arrangements were made. As I worked on Lily and Lia's new bedroom, no less than four ladybugs joined me. As I entered church this morning, a ladybug greeted me at the door. And Connie and Austin have been seeing them too. So, here we come Lia Faith. Ready or not. Ni cuh ma? After waiting 134 days since writing a Letter of Intent (LOI) to adopt Lia Faith, we were finally blessed with those three little letters that families adopting children from China know so well - LOA! October 24th, 2008. It's beginning to look a lot like Christmas ... in Beijing! We had a travel meeting with Lifeline Children's Services today, so we decided to go a little early and have lunch in Birmingham. So we stopped an hour or so before our appointed time with Lifeline. While we waited for our lunch to arrive, Connie says "Do you think Karla has our LOA?" Now, if you're a participant in this waiting game, you know that Thursdays are usually the days that LOAs arrive and since we didn't get a call yesterday, I answered "Connie, you know Karla knows how much we're anticipating that. If she got it, I'm sure she would have called us. So, no, I don't think she has it." Another conversation ensued about the wait. Conversations we have had numerous times, with each other, and separately by ourselves, alone with our thoughts. Questioning the process, wondering what had gone wrong, would it be next week since it wasn't this week, there's got to be something we can do, etc... This wouldn't be so difficult if we hadn't already committed to a particular child, whose beautiful face we have been staring at every day since mid-June. What we didn't know was that while we were having lunch, the overnight delivery service was pulled up to the door of Lifeline, unloading a document that would make our year! Karla received our LOA today and shared it with us as soon as we got to Lifeline. It was a great way to start the travel meeting. The travel meeting consisted of 5 families, at various stages of waiting, and was scheduled many weeks ago. So, for those of you who believe in consequences, maybe you'd think "What a great turn of events." I choose, however, to believe that this is simply God's plan at work. Giving us time to wait and think about and pray about Lia Faith and then having the LOA show up for our signature at the very moment we're to arrive for this travel meeting. For the record, we've signed the LOA and given it back to Lifeline!!!! In the course of the afternoon, we got to meet some awesome families who are sharing the same journey with us and who encourage us, simply by their presence and the reflection of God that we see in their actions and words relative to their own adoptions. We pray for each of these families and are so thankful that God introduced us to them at this time. We were also greatly blessed by the staff at Lifeline, Karla and Lauren, who lead a discussion of travel topics and bonding issues. We are so thankful we chose Lifeline because of their commitment to Jesus Christ and a biblical foundation for adoption. Now, there's only one more approval we await from the Chinese - Travel Approval, or affectionately known as TA amongst the inhabitants of the world known as adoption. Hopefully, our TA will come in time for our travel to occur before the end of the year. Thus, the earlier comment about Christmas in Beijing. Please pray with us and for us that TA will arrive on schedule as well so that we may bring Lia Faith home to be with her family and to receive the love she so deserves and the medical attention that she needs! And please pray with us for the other families who wait at various stages of this process, that God would strengthen their resolve and their commitment to His plan of adoption, as he has ours, and that their letters of approval will come in due time. Because that's what her husband had asked of her only weeks before. But God wanted me to know, and so He told me. In subtle and not so subtle ways. And He showed me everything I needed to know. Out of respect for privacy and admiration for an American hero, I will not say much more for now, but suffice it to say that God has placed before me an opportunity and a privilege and a responsibility to minister to the family of a fallen American hero. A man who did more for his country in a few short years than I can fully comprehend. By way of comparison, I feel inadequate. Don't get me wrong, I am very honored by what God has accomplished through me and of the family with which He has blessed me. Our God is an awesome God! He has given me the most awesome wife, son, and two daughters that anyone could wish for and has allowed me to work in His plan for adoption and care of His children in very magical ways. He has given me the opportunity to make the lives of children better by focusing on His Word and looking at one day at a time. And to see and understand their hurts and their joys, their wins and their losses. I've been blessed and honored to see what He has done through my own son, Austin, and I have been left in awe by the devotion He has placed in Connie's heart for Lily Grace and Lia Faith, and indeed every orphaned little girl in China. But in this, I have been humbled. When I met her and her children, something seemed different and when I saw that powerful word "deceased" written next to "Father's name," I understood that this would be a more significant opportunity than I have been privileged to in the past. And then God opened His trophy room and allowed me in for a while to read the rest of the story. To review the list of accomplishments of this American hero, from the valor demonstrated and attained in achievements that earned him the Purple Heart to the instructions he gave his family in the event of his untimely calling is to simply be in awe. The term "bravery" has been rendered incapable and insufficient to describe the honor of this great American hero. The term "courage" is an imposter to what these heroes really possess. Those of us who don't understand simply refer to it as courage, but what heroes such as this live and breathe and walk in every day of their lives is beyond courage. They fight for freedom, mine and Connie's and Austin's and Lily's and Lia's, and yours, while we enjoy the fruits of their labor. They sacrifice and their families sacrifice because of a calling not understood by many, with full understanding that each day could be their last. And oftentimes, we simply take that for granted. Shame on us! And then God, as He is prone to doing, places something in our path that is too big, too significant to simply take for granted. Such was the case on this day. When you look into the eyes of a child and know that child is left fatherless by events they do not control, or even know about, through sacrifices that benefit you, you have no choice but to be humbled. And to weep for the child. And to ask God "What can I do?" Here am I, send me. The answer is given in John Chapter 21, Verse 16 when Jesus says to Peter (and all disciples to follow) "Take care of my sheep." And again in Verse 17 "Feed my sheep." And later, in James 1:27, a verse written on the hearts of adoptive families around the world: "Religion that God, our Father, accepts as pure and faultless is this: to look after orphans and widows in their distress..." That He would place before me an opportunity such as this at a time such as this is difficult to understand and I hope, I pray, that I can fulfill His hopes and His wishes for ministry in this case. I will do my best, but I will not do this alone, because without Him, I can accomplish nothing, but with Him I can do all things. I have asked the Pastor for his help and he has agreed. And thus, the Army of the Lord arises and stands ready to receive its orders. On September 24th, 2004, God sent one of His most precious possessions to live on earth, in the hope that somehow, she would be able to change the world. The family that God placed her with could not keep her, for reasons known only to them and to God, and so they placed her at the gate of the Yongxiu County Social Welfare Institute in Jiangxi, China. The orphanage named her Jiang Yong Xing and she grew in God's grace and mercy until He readied a new family for her. We were that family and she has definitely changed our world and His. Just before her second birthday, Jiang Yong Xing became Lily Grace Xing Green and beban turning our world upside down. We've celebrated three birthdays with Lily Grace now - my how fast time goes by! The first year, we celebrated together as a family, just Lily Grace, Austin, and mommy and daddy. We didn't want to overwhelm her. It was such a cool celebration. Then last year, we had the children from church over for a Dora bounce party. Most of the kids were much older than Lily Grace, but it didn't matter to her. So this year, we decided to finally have one of those invite everyone parties that you simply cannot have at home - for fear of your home being destroyed! And so, Jump Zone agreed to let us terrorize their facility for a few hours one Saturday afternoon. This time, we invited all of Lily Grace's friends and she was so excited she could barely breathe by the time the party was to happen. Check out the pictures of Lily Grace and her friends at her "Jump Zone" party! Thank you to all of Lily Grace's friends for coming to the party and thanks to their parents for letting us share time with them. Thanks especially to Tom and Laura Morgan who drove from Russelville to bring Lily Grace's friend, Sarah to the party. 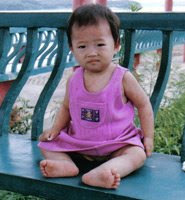 Sarah also grew up in the Yongxiu Social Welfare Institute in Jiangxi while waiting for her forever family. Happy Birthday Sweet Baby Girl! Mommy and Daddy and Austin love you! God, Jesus, and the Holy Spirit set up shop in the Fellowship Hall at Isom's Chapel on Wednesday night. And that we would be so fortunate and blessed to be there and witness His power and His grace, as His Word was so beautifully shared is hardly imaginable. For weeks, we had worried about this night (I know, I know, worry is opposite of faith). 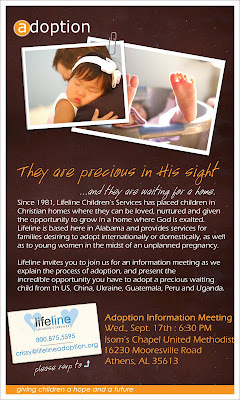 We had done all we could, and then some, to get the word out about an Adoption Information Meeting at our church. Lifeline Children's Services was coming to Isom's Chapel and we really wanted very badly for everyone to see why we chose Lifeline. We hoped and prayed for families to come and for God to be glorified and for the blessing that is adoption to be shared with families called by God to attend, learn, and possibly adopt one of His children. We planned and coordinated with Lifeline - Crissy is truly one of God's own angels! Crissy and I worked out an agenda and Lifeline planned their part (God was planning His part too!). We wrote an article and got it published in the Huntsville Times Faith and Values section - thank you Kay Campbell for your kindness and help. We mailed posters and brochures to over 60 churches and asked them to make an announcement to their congregations, with a goal of finding those with whom God was speaking ever so gently about His plan of adoption. We told our friends and asked them to tell their friends. We wrote articles for the church bulletin and had the meeting announced on our company websites. We asked our friends from Athens Families with Children from China for help and they responded by bringing food and supportive smiles! We wanted everything to be perfect and so we worked very hard. And we prayed. And the devil got mad! But there was simply nothing he could do. Because on this night, as with every other, he was defeated, banished to the sidelines to watch as God, Jesus, and the Holy Spirit did a victory dance in his end zone! After all our preparations, the day finally came for the meeting. We thought we might have a few families, but they were a bit iffy on whether they'd be there or not. We certainly didn't want Lifeline to travel all the way from Birmingham and have no one to speak to. "Oh ye of little faith," God said. "Have I not shown you many times over My power and My majesty? Why do you worry? The starting lineup is here now! Go, sit over there and watch!" I spent the last 30 minutes or so trying to pray in the sanctuary where it would be quiet. But the devil kept trying break up our little huddle. Little did I know that only a few words were needed. "God, let it be Your will that is done tonight and let us not get in the way of Your plans." The rest was extraneous. I can imagine God, amused at my ramblings when He had everything all worked out, saying to Jesus and the Holy Spirit "Well, we'll keep working on this one. But for now, let's get to work." So when Lifeline showed up, we discussed the order of service (we'd already coordinated that once, but a second time would be good, right?) The pastor would pray, then I would give a short testimony of our experiences with Lifeline and introduce Dave, the international director. Dave would talk about 5 minutes and then turn things over to Karla and Allison for 20 minutes each to discuss each country we work in. Ready, break! They asked how much time we'd have and I said to take as much time to say what the Lord would have them say. Then I decided to show Lifeline a video of their adoptive families, while we waited for guests. Austin and I had taken pictures at Lifeline's Reunion on Saturday and built a short video using those pictures. We intended to show the video at the meeting and wanted their blessing first. I completely underestimated the emotions this video would evoke. Pure, raw, unfiltered emotions that brought tears to the Lifeline staff's faces as they saw each child, once an orphan, smiling and happy with their forever families. Orphans they themselves had helped to bring home. If you've adopted, you know what I'm talking about. If you've been to an orphanage, you know what I'm talking about. If you've seen children anywhere in need, you know what I'm talking about. By the time the meeting began, God had put 7 to 10 families (not including Isom's Chapel or Athens FCC) in our midst and said "See, the harvest is plentiful, now let's get to work." We had 57 chairs in the fellowship hall and nearly all of them were filled. I followed the script as planned, but took a few minutes longer than we'd agreed on and then it was Dave's turn. But first, I showed the video. And that's where God said "I'll take it from here." Over the next 55 minutes, Dave gave the most passionate, unashamed, plea for God's people, present in the fellowship hall this night, to be "doers" of the Word and not hearers only, quoting James, Chapter 2. Karla and Allison never even got to speak. But that's OK, because by now, they were both a real mess! Dave completely put Lifeline and Isom's Chapel aside and focused on the Word, borrowing from Matthew, Mark, Luke, and John, quoting Paul, and describing Jesus and His disciples' interaction where children were concerned (Let the little children come unto me). All for the sake of bringing God's plan of adoption to the center of the room. And there weren't many dry eyes in our group as Dave related how 148 million orphans in the world simply want a daddy or a mommy, like our own children. And how several of them had crawled into his lap and asked "Are you my daddy?" Dave quoted Ephesians 2:8-9 "For it is by grace you have been saved, through faith ... it is the gift of God," a verse we carry on Lia Faith's web journal. And he gave us a plan with four options. 1) Adopt. Bring home a child who simply wants to belong. 2) Give. Adoption may not be for everyone, but you may be able to help a family gifted by God to be adoptive parents, but in need of financial resources. 3) Volunteer. Lifeline and other agencies need volunteers to reduce the costs for adoptive families. And to quote Dave, they promise not to call you more than once a week! or 4) Support. Pray for someone adopting, call them and simply tell them you love them for following God's will. Write them a letter - or comment on their blog. Dave made it clear that it is God's gift to us to be able to do one of these four things. Each of us has something in our hands that we can give for God's purpose. No matter how much or how little. Sometimes I tend to hold on to what I have in mine for fear I might not get it back. And I miss out on the blessing of what God would trade me for what's in my hand. Please don't miss that blessing yourself. Choose one of the four options and give God what's in your hand. And accept the blessing that's in His. Wow, I wish everyone could have been at God's table with us last night. When the meeting was over, I thought Karla and Allison were going to be overrun by the families wanting to get more information and ask their questions. I even got to talk to two families myself and both of them seem to be leaning heavily now toward adopting. I met a man with a funny name that I recognized and we determined that I had taught his little sister guitar lessons over 20 years ago. Another family came up and we found out that we work for the same company, so we'll be able to keep in touch. And as icing on the cake (BTW, we did have cake thanks to Connie! ), we had two families join Athens FCC this week. Thanks so much to our friends at Lifeline for all they did on this special night!!! And thanks to our 'family' at Athens FCC for the food and support (see number 4 above!). Sorry for the dissertation, but when God comes to town, you can't quit talking about it! Wow, for the past six or seven weeks, we have been so busy it seems. With school starting up and Austin's band activities and Lily Grace's school starting and Upward Basketball starting, and Austin and I taking Chinese language lessons, ... we have not had time to take a deep breath. On top of that, we decided to host an adoption seminar at Isom's Chapel and we have been very busy promoting the seminar (there's a separate motive for the is post!). The following is an article that should be published in the Huntsville Times on Friday, 12 September in the Faith and Values section. "The concept of adoption has found great acceptance among families called by God to reach out to orphans, both in the U.S. and abroad. Indeed, many adoptive parents are surprised to experience the same emotions that accompany the privilege of biological children. While it is God’s plan, it is our blessing to nurture these little additions to our families. Hello, we are Jerry and Connie Green. We worship at Isom’s Chapel and we are members of the Athens Chapter of Families with Children from China (FCC). We have two children at home, Matthew Austin and Lily Grace Xing Green, and we are expecting a third soon, by way of adoption. Lily Grace was born in Jiangxi Province, China on Sept 24th, 2004. We traveled to China to adopt her on July 23rd, 2006. Now, we are in the process of adopting a second little girl, also from China, whom we hope to bring home this year. Her name is Lia Faith Xurong Green. Lia Faith was born on March 23rd, 2006. Because there are so many children, both here in the U.S. and abroad, that need a forever family, and because we have been witness to the conditions under which they survive, we have chosen to do what we can to help. Our advice to others seeking to adopt is to first pray and ask God for direction and then act according to His plan. The concept of adoption is simple; however, the process and the associated paperwork can be quite cumbersome, especially for international adoptions. The “paperwork pregnancy” can last two or three years. 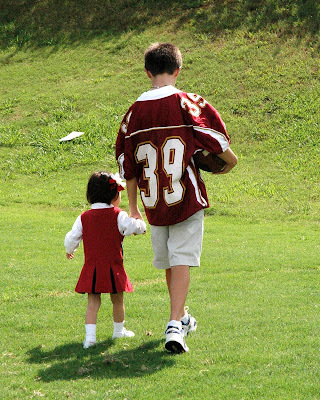 Thankfully, there are many agencies that provide services and counseling for adoptive parents. Lifeline Children’s Services is one such agency. Lifeline provides services for families wishing to adopt domestically or internationally. Founded in 1981, Lifeline is focused on placing children in Christian homes where they can be loved, nurtured, and given the opportunity to grow in a home where God is exalted. In addition to the staff here in Alabama, Lifeline provided in-country facilitators in China to help complete the adoption and act as interpreters and guides to a family certainly stepping out of its comfort zone to receive a blessing from God. We could not imagine having completed our adoption of Lily Grace, and now Lia Faith, without the experienced help and loving support of the staff at Lifeline. The opportunity for adoptive families to support one another is an important aspect after the adoption becomes final and the adoption agency has completed its work. Organizations such as FCC with chapters in Athens, Decatur, Huntsville, and Florence provide opportunities for adoptive families to fellowship with one another and share their experiences. These organizations hold many events during the year that allow the children to spend time together learning the culture of their birth country. This time can be crucial to the growth of the adopted child. The Athens Chapter of FCC has grown to over 25 families and meets regularly to celebrate various U.S. and Asian holidays. We have been greatly blessed to be a part of this group of families, whom we did not know before, and count its members as some of our very best friends. 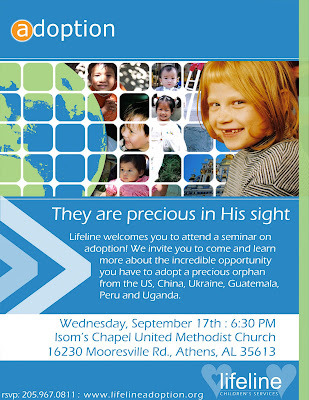 As part of our mission to help other adoptive families, we welcome everyone to attend an informational meeting on adoption, presented by Lifeline Children’s Services. The meeting will be at Isom’s Chapel on Sept 17th at 6:30 pm. In addition to Lifeline, members of Athens FCC will be on hand to answer questions regarding post adoption support groups." We would be honored to have you as our guests on the 17th during the Adoption seminar presented by Lifeline Children's Services. Isom's Chapel is located at 16230 Mooresville Road, Athens, AL 35613. The phone number for the church office is 232-5892. “In love, He predestined us to be adopted as His sons through Jesus Christ, in accordance with His pleasure and will…” Ephesians 1:5.